Yesterday I did a wedding vow renewal for a North Carolina couple, married 10 years. After their ceremony, they took off for a helicopter ride over the island! I do vow renewals all the time, and everyone is special to me. I love to see the surprise in husband or wife’s eyes when their spouse does or says something so tender and romantic. Most of the people choosing to renew their marriage vows are ordinary people like you and me, just a very loving, and thoughtful spouse. Last year I officiated a 50th wedding vow renewal ceremony for a couple from Virginia. They were on a cruise with their grown children and grand children. I used the ceremony my own parents , Vernon & Francine Jackson had used for their 50th wedding vow renewal. This was probably my most memorable vow renewal. You don’t have to have a vow renewal for one of the big anniversaries however, you can have them just because you want to do something special to remind your spouse of how important your marriage is to you. I have had husbands and wives do all sorts of special things. Special flowers, for example, special readings, and vows they wrote themselves. Some husbands and wives duplicate the whole wedding ceremony, even going so far as to have new rings, and to have members of their original wedding party present as witnesses to their renewal. My hands-down favorite is a wedding vow renewal with the couple’s children present. 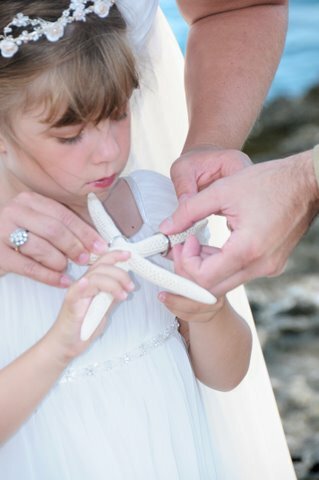 I try and include the children in the ceremony in some way, to create a happy memory which they will always remember. As a teacher, a mother and a grandmother, I strongly believe in showing by example. I never lose an opportunity to highlight my belief in the institution of marriage. Sometimes a couple have only been married a few years, and if they have had a civil ceremony in a courthouse of judge’s chambers they want to have the traditional vows, flowers, champagne and photos in an exotic location like Grand Cayman. In these cases I do a “Wedding Blessing” and the ceremony has a different structure, which is much more like a wedding ceremony. Wedding Blessings have become quite popular with cruise visitors as well, and is good value for money, since there is no Special Marriage License necessary. Simply Weddings has one low price for a wedding vow renewal or a wedding blessing, and we provide complimentary champagne and or sparkling non-alcoholic cider served chilled on the beach.